“But I’m just not good at writing.” It’s a lament I hear on almost a daily basis, as students come to me looking for an easy way to fix their work. Believe it or not, in most cases, writing is easy to fix. Of course, there are exceptions, but when writing reads awkwardly or doesn’t make sense, it is either 1) not well thought out or 2) thrown together without consideration of what has actually been put on the paper. I’ve posted before about thinking and how it relates to writing. If you’re struggling with what to say, you may want to head over there. But if you know what you want to say and no one understands you, or their eyes fix while reading your work, persevere here. Right out of graduate school, I taught Writing and Composition at UNC Charlotte. I had a mantra for my students, “Be precise, and be concise.” If you can pull this off, you can be confident that your writing is “better”. But easier said than done, as the old adage goes. Let’s start with “concise”, mainly because I have less to say about it. And that is the point entirely. Don’t use more words than needed to communicate your thoughts. Condense, cut, and show no mercy to your work. Use as few words as possible. Precision – making writing better one ambiguity at a time. Be “precise”. This one is harder because you already know what you are trying to say, but you’re trying to communicate it to an entirely different person, who has a unique way of looking at the world and may be clueless as to what is informing your thoughts and ideas. People get into serious trouble in this arena when they begin to write exactly the way they talk. A conversation always includes a context, and that context helps inform its participants. Like an inside joke, context allows the speaker to leave out details without adversely effecting meaning. But in writing, we rarely have that luxury, especially if your audience encompasses any sort of range. So how can you become more precise? Of course you can increase your vocabulary. (Always do this. It’s very important no matter how long you’ve been out of school.) But most importantly, pay attention to your pronouns. He, she, it – while extremely valuable – can wreck havoc on your writing if used flippantly. Remember that pronouns take the place of nouns, and they tend to refer to a noun close to them. If you are considering two items, it will refer to the last item you named. Remember that. Say what you mean. If it’s not worth stating, it’s not worth implying, and you certainly don’t want folks inferring. Chances are, they’re going to infer something you really didn’t mean…or their eyes will simply glaze over. 10 Responses to "What Are These Things? 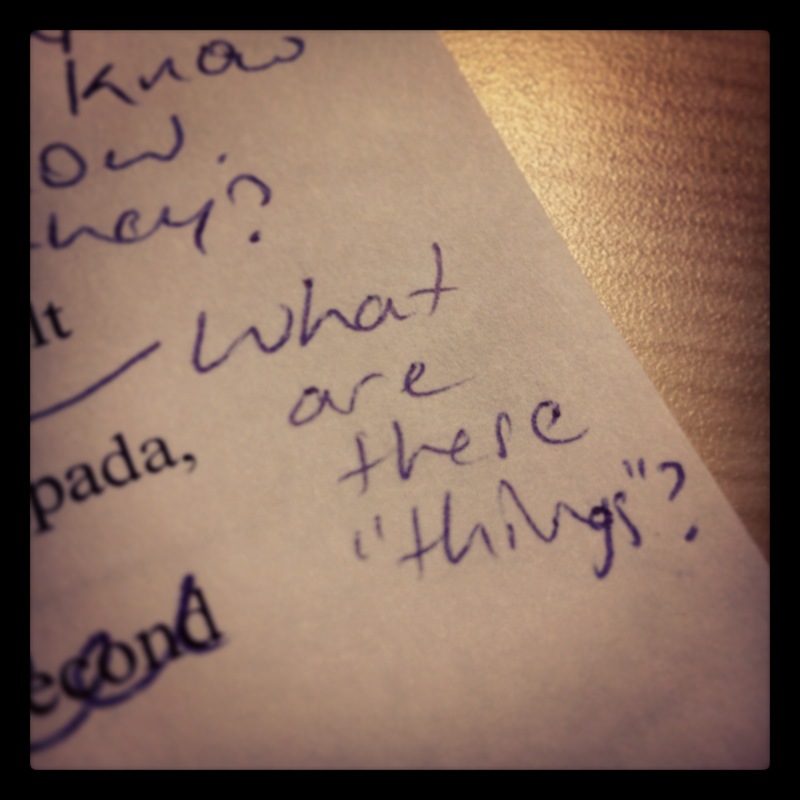 : How to Make Your Writing Better"
Karina Garzon Johnson liked this on Facebook. I miss talking about books with you after Muy Thai. I am currently re-reading all Kurt Vonnegut’s work. Sue Johnson liked this on Facebook. Tom, I miss talking books with you too. My schedule is super challenging right now, but I’ll be at Muay Thai tomorrow. Hopefully, I’ll see you 🙂 Mike added a Vonnegut book to my list a while ago. The title’s slipped my mind at the moment, but I’ll let you know when I find out what it is. June Bartholomew liked this on Facebook. Joe Ciarlante liked this on Facebook. Ying Yaemsiri-King liked this on Facebook.